For other uses, see West Cape. Topography of the Western Cape. The Roggeveld and Nuweveld mountains are part of the Great Escarpment (see diagrams below). The other mountain ranges belong to the Cape Fold Belt, also shown in the diagrams below. The Western Cape's inland boundary lies for the most part at the foot of the Great Escarpment. An approximate SW-NE cross section through South Africa with the Cape Peninsula (with Table Mountain) on left, and northeastern KwaZulu-Natal on the right. Diagrammatic and only roughly to scale. It shows the major geological structures (coloured layers) that dominate the southern and eastern parts of the country, as well as the relationship between the Central Plateau, the Cape Fold Mountains, and the Drakensberg escarpment. 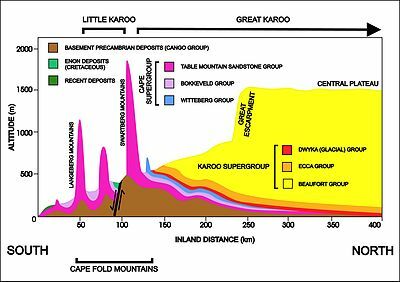 The significance and origin of the geological layers can be found under the headings "Karoo Supergroup" and "Cape Supergroup". A diagrammatic 400 km north-south crosssection through the southern portion of the country at approximately 21° 30’ E (i.e. near Calitzdorp in the Little Karoo), showing the relationship between the Cape Fold Mountains (and their geological structure) and the geology of the Little and Great Karoo, as well as the position of the Great Escarpment. The colour code for the geological layers is the same as those used in the diagram above. The heavy black line flanked by opposing arrows is the fault that runs for nearly 300 km along the southern edge of the Swartberg Mountains. The Swartberg Mountain range owes some of its great height to upliftment along this fault line. The subsurface structures are not to scale. The Western Cape Province is roughly L-shaped, extending north and east from the Cape of Good Hope, in the southwestern corner of South Africa. It stretches about 400 kilometres (250 mi) northwards along the Atlantic coast and about 500 kilometres (300 mi) eastwards along the South African south coast (Southern Indian Ocean). It is bordered on the north by the Northern Cape and on the east by the Eastern Cape. The total land area of the province is 129,462 square kilometres (49,986 sq mi),:9 about 10.6% of the country's total. It is roughly the size of England or the State of Louisiana. Its capital city and largest city is Cape Town, and some other major cities include Stellenbosch, Worcester, Paarl, and George. The Garden Route and the Overberg are popular coastal tourism areas. The Western Cape is the southernmost region of the African continent with Cape Agulhas as its southernmost point, only 3800 km from the Antarctic coastline. The coastline varies from sandy between capes, to rocky to steep and mountainous in places. The only natural harbour is Saldanha Bay on the west coast, about 140 km north of Cape Town. However a lack of fresh water in the region meant that it has only recently been used as a harbour. The province's main harbour was built in Table Bay, which in its natural state was fully exposed to the northwesterly storms that bring rain to the province in winter, as well as the almost uninterrupted dry southeasterly winds in summer. But fresh water coming off Table Mountain and Devil's Peak allowed the early European settlers to build Cape Town on the shores of this less than satisfactory anchorage. The province is topographically exceptionally diverse. Most of the province falls within the Cape Fold Belt, a set of nearly parallel ranges of sandstone folded mountains of Cambrian-Ordovician age (the age of the rocks is from 510 to about 330 million years ago; their folding into mountains occurred about 350 to about 270 million years ago). The height of the mountain peaks in the different ranges vary from 1000m to 2300m. The valleys between ranges are generally very fertile as they contain the weathered loamy soils of the Bokkeveld mudstones (see the diagrams on the left). The far interior forms part of the Karoo. This region of the Province is generally arid and hilly with a prominent escarpment that runs close to the Province's most inland boundary. The Escarpment marks the southwestern edge of South Africa's central plateau (see the middle and bottom diagrams on the left). It runs parallel to the entire South African coastline except in the very far northeast, where it is interrupted by the Limpopo River valley, and the far northwest, where it is interrupted by the Orange River valley. The 1000 km-long northeastern stretch of the escarpment is called the Drakensberg, which is geographically and geologically quite distinct from the Cape Fold Mountains, which originated much earlier and totally independently of the origin of the escarpment. The vegetation is also extremely diverse, with one of the world's seven floral kingdoms almost exclusively endemic to the province, namely the Cape Floral Kingdom, most of which is covered by Fynbos (from the Afrikaans meaning "Fine Bush" (Dutch: Fijnbosch), though precisely how it came to be referred to as such, is uncertain.). These evergreen heathlands are extremely rich in species diversity, with at least as many plant species occurring on Table Mountain as in the entire United Kingdom. It is characterised by various types of shrubs, thousands of flowering plant species and some grasses. With the exception of the Silver tree, Leucadendron argenteum, which only grows on the granite and clay soils of the Cape Peninsula, open fynbos is generally treeless except in the wetter mountain ravines where patches of Afromontane forest persist. The Western Cape is also climatologically diverse, with many distinct micro- and macroclimates created by the varied topography and the influence of the surrounding ocean currents. These are the warm Agulhas Current which flows southwards along South Africa's east coast, and the cold Benguela Current which is an upwelling current from the depths of the South Atlantic Ocean along South Africa's west coast. Thus climatic statistics can vary greatly over short distances. Most of the province is considered to have a Mediterranean climate with cool, wet winters and warm, dry summers. Both the Great Karoo and Little Karoo, in the interior, have an arid to semi-arid climate with cold, frosty winters and hot summers with occasional thunderstorms. The Garden Route and the Overberg on the south coast have a maritime climate with cool, moist winters and mild, moist summers. Mossel Bay in the Garden Route is considered to have the second mildest climate worldwide after Hawaii. In December 1968, the South African Student Organization (SASO) was formed at a conference held in Marianhill, Natal. The conference was exclusively attended by Black students. After its launch, SASO became the medium through which black consciousness ideology spread to schools and other university campuses across the country. In 1974, the then South African Minister of Bantu Education and Development, MC Botha, constituted the imposition of using Afrikaans as a medium of instruction in black schools, effective with students in Grade 7 (Standard 5) upwards. As early as March 1976, students began passive resistance against Afrikaans, fueling the outbreak of the Soweto Uprising on 16 June 1976. Consequently, the student protests spread to other parts of the country, and Cape Town became a pivotal site for Western Cape student revolt. Student leaders at the University of the Western Cape (UWC) and the University of Cape Town (UCT) organised marches. Poster parades by UWC and Black Power Salute marches by UCT was broken by the police, resulting in 73 students getting arrested and detained at Victor Verster Prison, near Paarl. On 1 September 1976 the unrest spread to the city of Cape Town itself. Approximately 2000 black students from Western Cape townships, namely Langa, Nyanga and Gugulethu, matched the Cape Town central business district (CBD). Coloured students also contributed to the protests by peacefully marching to the city, but were blockaded by the police in the CBD. The protests turned violent when coloured students started burning schools, libraries and a magistrate's court in support of the student revolt. Thereafter, 200,000 coloured workers partook in a two-day strike staying away from work in the Cape Town area. According to a report by the Truth and Reconciliation Commission (TRC), the Western Cape experienced the second highest number of deaths and casualties associated with the 1976 uprising protests. In the 2004 election there was again no absolute winner in the provincial parliament; this time the ANC won 19 seats, the DA won 12, and the NNP won 5. The ANC-NNP coalition continued in power, but van Schalkwyk took up a ministerial post in the national cabinet and was replaced as Premier by the ANC's Ebrahim Rasool. The NNP was finally dissolved after the 2005 floor-crossing period and its members joined the ANC, again giving that party an absolute majority of 24 seats. In the 2007 floor-crossing period the ANC gained a further three members of the provincial parliament. In 2008 Rasool resigned as Premier due to internal party politics, and was replaced by Lynne Brown. The provincial government is established under the Constitution of the Western Cape, which was adopted in 1998. The people of the province elect the 42-member Western Cape Provincial Parliament every five years by a system of party-list proportional representation. The fifth provincial parliament was elected in the election of 7 May 2014; 26 seats are held by the Democratic Alliance, 14 by the African National Congress, and 1 each by the Economic Freedom Fighters and the African Christian Democratic Party. The provincial parliament is responsible for legislating within its responsibilities as set out by the national constitution; these responsibilities include agriculture, education, environment, health services, housing, language policies, tourism, trade, and welfare. The provincial parliament also elects the Premier of the Western Cape to lead the provincial executive. Since 2009 the Premiership has been held by Helen Zille, former leader of the Democratic Alliance. The Premier appoints ten members of the provincial legislature to serve as a cabinet of ministers, overseeing the departments of the provincial government. These departments are Agriculture, Community Safety, Cultural Affairs and Sport, Economic Development and Tourism, Education, Environmental Affairs and Development Planning, Health, Human Settlements, Local Government, Social Development, Transport and Public Works, and the Provincial Treasury. The Western Cape's total GDP for 2008 was R268bn, making the province the joint 2nd largest contributor to the country's total GDP, at 14%. It also has one of the fastest growing economies in the country, growing at 4% in 2008 At 19.3% the province has a substantially lower unemployment rate than the national average standing at 20% in 2018. The city of Cape Town's Gini coefficient of 0.58 is lower than South Africa's Gini coefficient of 0.7 making it more equal than the rest of the country whilst still being extremely high and unequal by international standards. The Western Cape's Human Development Index is the highest in South Africa at 0.7708 compared to the South African average of 0.6675 in 2003. The biggest sector in the Western Cape's economy is the financial, business services and realestate sectors contributing approximately R77 billion in 2008. Manufacturing was the second largest contributor valued at R43.7 billion in 2008 with the agricultural sector being the fastest growing at 10.6% in the same year. High-tech industries, international call centres, fashion design, advertising and TV production are niche industries rapidly gaining in importance. The city of Cape Town is ranked as the most entrepreneurial city in South Africa with Early-Stage Entrepreneurial Activity being 190% greater than South Africa's national average. The Western Cape has an excellent network of highways comparable with any first-world country. The primary highways are the N1 (from Cape Town to Three Sisters, continuing outside the province towards Bloemfontein and Johannesburg), N2 (from Cape Town to Bloukrans River, towards Port Elizabeth), N7 (from Cape Town to Bitterfontein, continuing towards Springbok and Namibia) and N12 (from George to Three Sisters, continuing towards Kimberley and Johannesburg). Other routes are the "R" roads which connect the smaller towns. All major roads are tarred with major rural gravel roads well maintained. 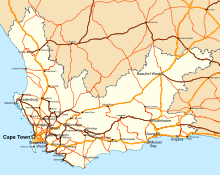 Limited access motorways are limited to the Cape Metropolitan Area, Winelands and Garden Route, however due to the low population density of the remainder of the province, the highways remain efficient and high-speed, except during peak holiday travel seasons, when travel can be slow-going in places due to heavy traffic. Telecommunications in the province are highly sophisticated. Landline telephones are available extensively, and the majority of large urban nodes have access to ADSL and other high-speed internet services. Mobile cellular networks are world-class, with reception extending from cities to highways and many remote rural areas. Mobile networks also play an important role in the internet space due to their speed and widespread availability. Major cities and towns have access to mobile internet speeds in excess of 21 Mbit/s (HSDPA+). In areas where HSDPA+ is not available, networks make provisions for HSDPA, 3G, EDGE or finally GPRS if demand does not warrant higher speed investment. The 2011 Census recorded the population of the Western Cape as 5,822,734 people living in 1,634,000 households. :8, 63 As the province covers an area of 129,462 square kilometres (49,986 sq mi),:9 the population density was 45.0 inhabitants per square kilometre (117/sq mi) and the household density 12.6 per square kilometre (33/sq mi). 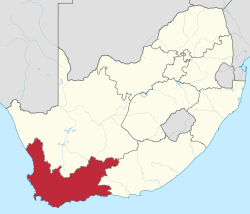 Roughly 16% (894,289 people) of the Western Cape's population in 2011 were born in the Eastern Cape, 3% (167,524) in Gauteng and 1% (61,945) in KwaZulu-Natal. People born outside of South Africa amounted to 4% of the province's population or 260,952 people. 90% of households in the province have a flush toilet:84 and 90% have refuse removed by the local council at least once a week. :96 75% of households have piped tap water inside the dwelling, while a further 13% have piped water on their property; 11% receive piped water at a community tap, while 1% have no access to piped water. :77 One in seven people live in an informal dwelling. The average annual household income was R143,460, the second-highest in the country after Gauteng. :37 As of September 2012[update], 69% of the population aged 15–64 are economically active, and of these 25% are unemployed. Overall, 52% of the working-age population are employed. Around 2 million people in the Western Cape labour market (those aged 16 to 64) are employed, 1.3 million are not economically active, 552,733 are unemployed with an additional 122,753 who are discouraged work seekers who want to work but have given up looking for it. The province is also home to the South African Military Academy. Over 50% of all cheese in South Africa is produced in the Western Cape. The Western Cape is known for its wine production and vineyards. The winelands are divided into six main regions: Boberg, Breede River Valley, Cape South Coast, Coastal Region, Klein Karoo and Olifants River. Each has unique climate, topography and fertile soil. ^ a b c d e f g h i j k l m n o p q r Census 2011: Census in brief (PDF). Pretoria: Statistics South Africa. 2012. ISBN 9780621413885. ^ Compton, J.S. (2004).The Rocks and Mountains of Cape Town. p. 24-26, 44–70. Double Storey Books, Cape Town. ^ a b Truswell, J.F. (1977). The Geological Evolution of South Africa. pp. 93–96, 114–159. Purnell, Cape Town. ^ McCarthy, T.S. (2013) The Okavango delta and its place in the geomorphological evolution of Southern Africa. South African Journal of Geology 116: 1–54. ^ Norman, n. & Whitfield, G. (2006). Geological Journeys. p.290-300. Struik Publishers, Cape Town. ^ a b c d Manning, John (2007). "The World of Fynbos". Field Guide to Fynbos. Cape Town: Struik Publishers. pp. 8–23. ISBN 9781770072657. ^ a b c d Trinder-Smith, Terry (2006). "Introduction". Wild Flowers of the Table Mountain National Park. Cape Town: Botanical Society of South Africa. pp. 19–35. ISBN 1874999600. ^ Manning, John (2007). "Cone Bush, Tolbos". Field Guide to Fynbos. Cape Town: Struik Publishers. p. 258. ISBN 9781770072657. ^ Branch, M & Branch G. (1981). The Living Shores of Southern Africa. pp. 14–18. Struik Publishers, Cape Town. ^ "Black Consciousness and Student Revolt in the Cape". South African History Online. Retrieved 16 June 2014. ^ "Black consciousness and student revolt in Cape Town". South African History Online. Retrieved 14 June 2014. ^ Cilliers, Charles. "Khoi-San king declares that the Cape has seceded from SA". ^ "Khoisan Nation serves Cape Town parliament with eviction notice". 18 July 2018. ^ a b "Western Cape Economic Overview". Westgro. Archived from the original on 25 December 2010. Retrieved 14 May 2011. ^ "Western Cape unemployment rate drops to below 20% - StatsSA". www.iol.co.za. Cape Argus. Retrieved 16 February 2019. ^ Western Cape Government (2017). "SEP Socio-Economic Profile: City of Cape Town" (PDF). www.westerncape.gov.za. ^ "A profile of the Western Cape province: Demographics, poverty, inequality and unemployment" (PDF). Elsenburg. August 2005. Archived from the original (PDF) on 24 June 2011. Retrieved 30 January 2012. ^ Adelzadeh, Asghar; et al. South Africa Human Development Report 2003 (PDF). Cape Town: Oxford University Press. p. 282. ISBN 978-0-19-578418-3. ^ "Cape Town outshines rest of SA in entrepreneurship". University of Cape Town. Retrieved 26 February 2011. ^ a b c Barnes, Clayton (14 February 2013). "Cape's population by the numbers". Cape Argus. Retrieved 21 February 2013. ^ a b c Census 2011: Statistical release (PDF). Pretoria: Statistics South Africa. 30 October 2012. Archived from the original (PDF) on 13 November 2015. Retrieved 24 November 2015. ^ Quarterly Labour Force Survey: Quarter 3, 2012 (PDF). Pretoria: Statistics South Africa. 1 November 2012. ^ "The most racist provinces in South Africa". BusinessTech. 7 September 2016. Retrieved 27 April 2017. ^ "Skilled Workforce reference". South African Department of Sport And Recreation. ^ Hurt, J.; Ehlers, S. (2008). The Complete Idiot's Guide to Cheeses of the World. THE COMPLETE IDIOT'S GUIDE. DK Publishing. p. 204. ISBN 978-1-4406-3618-9. Wikimedia Commons has media related to Western Cape. Wikivoyage has a travel guide for Western Cape.